In a large bowl, add in oat flour, protein powder, coconut oil, water, sea salt, and eggs. Mix thoroughly. Next, add in baking cocoa and Stevia and mix until completely combined. Add in shredded coconut, mixing into batter. 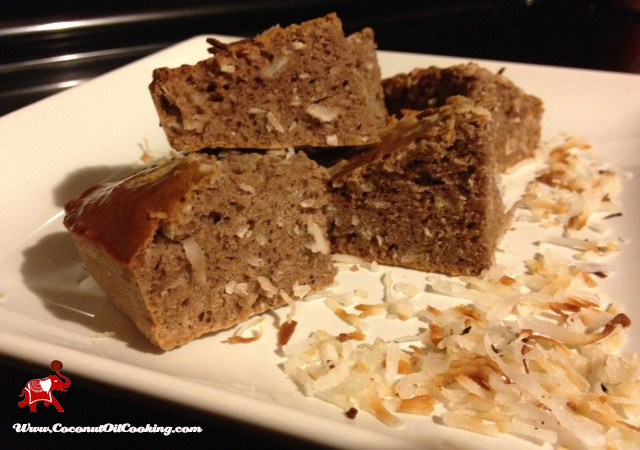 Spray a baking pan with Kelapo coconut oil cooking spray and add in the mixture. 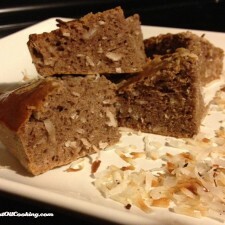 Top with shredded coconut and place in the oven for 25 minutes. I couldn’t wait to dive into this bread! The coconut oil, shredded coconut, and chocolate flavors blend perfectly together. Besides breakfast or a mid-day snack, I’ve found that this is the perfect way to satisfy your sweet tooth. One loaf usually lasts me about three to five days, depending on how much I’ll eat in one sitting. For more protein packed recipes, check out Michelle’s Protein Breakfast Cookie, Jen’s Perfect Steak Meal, and my Energy Boosting Coffee Protein Shake.